BBC NEWS | Africa | Is Premier League killing Nigerian football? Is Premier League killing Nigerian football? About 30,000 Nigerians took advantage of a rare chance to see their football heroes in action on Sunday, as Manchester United beat Portsmouth 2-1 in a friendly in the capital, Abuja. The attendance was higher than for many games between local teams and while the popularity of the Premier League grows in Nigeria, it seems to be at the expense of the domestic league. Observers say the future is bleak for Nigerian football, with all its brightest stars being drawn to Europe, while its own clubs wither and die, watched by fewer and fewer people. The coach of FC Abuja says the league officials need to change the time of their matches to avoid Premiership fixtures. "Whenever we play at the same time as an Arsenal game, nobody shows up," says Abdu Maikaba. Attendances are already very low. In a country of 140 million people, where crowds will stop and watch amateurs playing in the park, professional league games struggle to get more than 20,000 paying fans to come on match days. Tony Collins is from Anambra State in south-eastern Nigeria - and he supports Manchester United. "I like Man Utd because they're winners. Actually I like any club that wins in Europe. Nigerians like winners, we're simple people. Nigerian clubs? Can you really compare? They're rubbish, I don't waste my time with that." Only one or two teams have the following to sell out their home grounds, says Ismaila Lere, sports editor at the Daily Trust newspaper. "When you look at the stadiums you'll find that the stands are virtually empty, while the bars and the joints that have satellite TV are full. People will pay to watch the Premier League on TV but not to watch Nigerian football live," he says. The trouble started back in the early 1990s, he says. Economic reforms meant many teams went bust and were not able to pay their players. Those players started looking towards Europe for employment. Initially, they went to Italy and Germany. 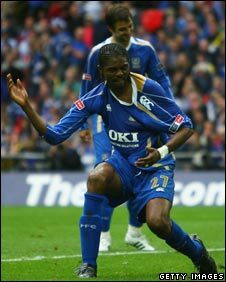 Most Nigerians first got wind of the Premier League when Celestine Babayaro joined Chelsea in 1997. "In the 1980s, I was the only person in my area who was watching English football," Mr Lere says. Now Nigerians are, like most of the world, obsessed with the English Premier League. But in Nigeria the obsession is now going too far - after the Champions League final in May, seven people in Nigeria died in clashes between Manchester United and Chelsea fans. And many young players want to play in the lucrative leagues in Europe. "When a player won't even be paid £1,000 ($2,000) per month in Nigeria, but can get £1,000 a week in Europe, what do you expect?" says Tukur Babangida, Chairman of Kano Pillars, this year's champions in Nigeria's top league. He says that players moving to Europe is a good thing. "Young people are inspired by the Premier League, it spurs them on to play, and the money the teams get when they move to Europe is good for the clubs." He says corruption is rife in the Nigerian league and means that money never gets to clubs' coffers. "There is no accountability in the sport here. Players won't see the balance of their salaries and transfer fees go straight into people's pockets." The coach of Kano Pillars resigned at the end of this winning season, sick of the corruption. Clubs are run by state governments and are viewed as the personal possession of the state governor. Match-fixing is rife, Mr Lere says. In one instance, the governor of one state asked another to throw a key match. "The second governor told his team to lose by four goals," says Mr Lere. It is little wonder that people do not bother watching Nigerian league football. If current trends continue, everyone will support a Premier League team and forget about their local sides, Mr Lere says. "It's part of globalisation. Football is not immune to that." Supporters do not seem to care that the sides they support are not Nigerian. "You can see I'm an Arsenal fan by the hat on my head," says Godwin Sunday, a 27-year-old labourer in Abuja. 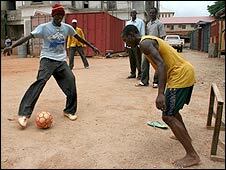 He and his friends play football in their lunch break with a soft deflated ball and bare feet or broken shoes. "I won't be going to the match on Sunday but I never miss a Premier League match," he says. "Would I go to a Nigerian game? No. The Arsenal are too much better." Abu Maikaba says the Nigerian Football League need to change their schedule urgently. "If they can make it so we play on a day before or after Arsenal, that will be a start."